Benjamin West (1738–1820), The Death of Nelson (1806), oil on canvas and panel, 182 x 247.5 cm, Walker Art Gallery, Liverpool, England. Wikimedia Commons. Britain was in crisis by the time that war with the French was declared in 1803. The paintings of Benjamin West (1738–1820), who was then the second President of the Royal Academy, had also reached something of a crisis. Having declared his famous painting of The Death of General Wolfe to be a revolution in history painting, he had painted anything but modern history since. Now that his adopted country was making more history than it had for a long time, surely he would rally to the cause? Cicero Discovering the Tomb of Archimedes, painted in 1804, the year that Napoleon became Emperor of the French, is a decidedly strange choice of subject. It was a second version of a painting which he had made in 1797, and apparently little-changed from the first. Cicero wrote in his Tusculan Disputations (book 5, sections 64-66) that he located Archimedes’ grave, neglected and buried in undergrowth, near the Agrigentine Gate of Syracuse, on the Italian island of Sicily. Cicero described the cylindrical column with a sphere mounted on top, which is shown partly obscured in West’s painting, and a symbol of Archimedes’ mathematical achievements. West shows Cicero wearing a white toga, speaking in front of the tomb, as workers with sickles clear the undergrowth from it. In the distance is the city of Syracuse on its coastal plain, and beyond it the smoking cone of the active volcano, Mount Etna. Once again, his style owes much to Nicolas Poussin. Benjamin West (1738–1820), Thetis Bringing the Armour to Achilles (1804), oil on canvas, 68.6 x 50.8 cm, Los Angeles County Museum of Art, Los Angeles, CA. Wikimedia Commons. If Archimedes’ tomb lacked contemporary relevance, West’s two paintings of Thetis Bringing the Armour to Achilles were more appropriate. 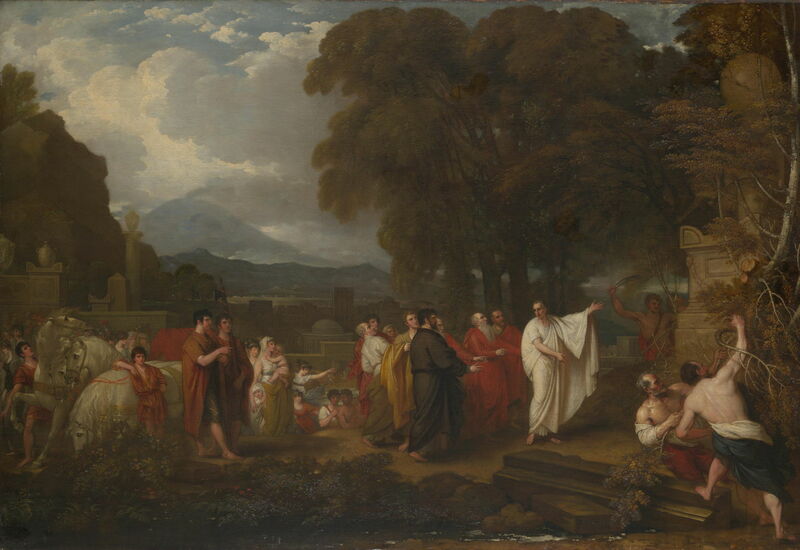 This first version, painted in 1804 and now in Los Angeles, is the tighter composition and shows some influence, perhaps, by the more neo-classical narrative works of David. 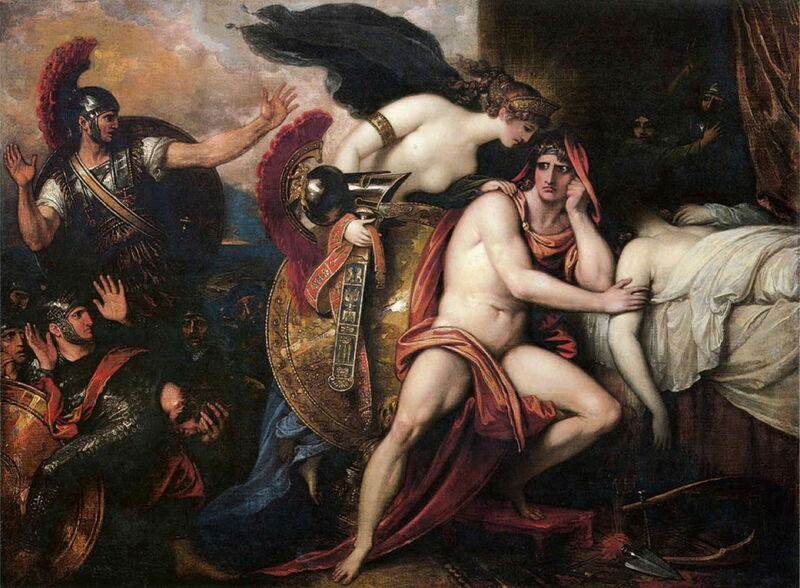 During the Trojan War, Achilles, the son of Thetis and greatest of the Greek warriors, took Briseis as a prize of war. At the start of the account in the Iliad, Agamemnon, leader of the Greek forces, has decided that he will take Briseis for himself. Achilles resents this, and withdraws from involvement in the fighting. In Achilles’ absence, his close friend Patroclus leads a battle in which he wears Achilles’ armour. Patroclus is killed there, and Achilles laments over his corpse. His mother Thetis visits Achilles during this, to console him in his grief, and promises to return with impregnable armour forged by the god Vulcan (Hephaestus). When she does return with the shield and armour, Achilles is still lamenting over Patroclus, worried now that his friend’s body will decay if he returns to battle. Thetis protects the body of Patroclus with ambrosia and nectar, enabling Achilles to return to battle and kill Hector, the leading warrior of Troy. As with most other depictions of this story, West shows Achilles with the body of Patroclus, and Thetis presenting the armour of Vulcan/Hephaestus to her son. He follows tradition by showing each of them largely unclad, with theatrical gestures and expansive sweeps of their arms. Although the underlying message might have had great contemporary relevance, West has resorted to traditional narrative technique and style. Benjamin West (1738–1820), Thetis Bringing the Armour to Achilles (1806), oil on canvas, dimensions and location not known. Wikimedia Commons. Two years later, his second version of Thetis Bringing the Armour to Achilles (1806) has reversed the arrangement of the three principal figures, and added extras at the left and right (in the murky shadows) whose gestures are so theatrical as to now appear comical. This version also lacks the Davidian touch, and appears more like a narrative work from a century earlier, perhaps. The previous year, 1805, had seen Britain’s greatest naval engagement, and the effective defeat of Napoleon’s attempts at invasion. As with General Wolfe before, this was at the cost of the successful commander, Admiral Lord Nelson, who was already a national hero. Here was modern history which West simply had to paint in modern terms. Nelson had been on the deck of his flagship, HMS Victory, when he was hit by a marksman from the nearby French ship Redoutable. Nelson was first seen kneeling on the deck, before falling onto his side. Thomas Hardy, captain of Victory, was with him, and Nelson was shortly carried below by the Sergeant-Major of the Royal Marines and two seamen. He died three hours later. West’s painting of The Death of Nelson was completed the following year, in 1806, and was one of the first works by a prominent artist to tell this story. The quarterdeck of Victory is shown as being crowded with people, some apparently mustered to watch Nelson’s dying hours. Nelson, at the lower centre, reclines with the support of three young sailors (probably midshipmen). There is little or no evidence of his injury, although his face has a distinctive pallor, and there is a small splash of blood near his hat, which rests on the deck to the left of his legs. 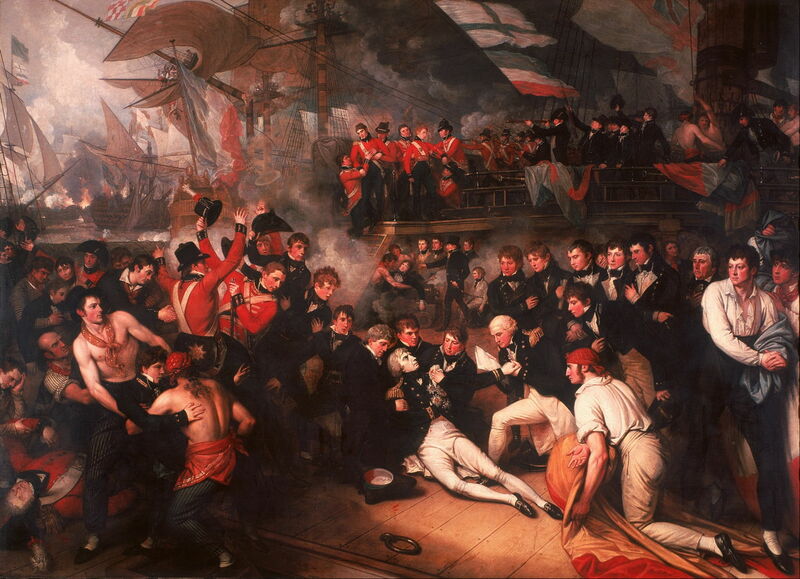 To the right of the hero is Captain Hardy, holding an outstretched hand which appears to be Nelson’s, but which bears gold braid which doesn’t match that of Nelson’s other (missing) arm, tucked into his jacket. Hardy holds papers in his right hand, and is half-kneeling. To the left of Nelson’s group are five figures, a mixture of Royal Marines in their scarlet tunics and sailors in deep blue, who appear to be cheering with their hats raised, looking towards Nelson with surprise. A contrasting group of young officers stands to the right, behind Hardy, who appear to be merely witnesses to Nelson’s plight. There are other groups around tending to wounded sailors, and on the poop deck behind a party of Royal Marines are shooting at the enemy still, while naval officers are raising their hats in celebration. Although the central group around Nelson echoes West’s composition in The Death of General Wolfe, it is not the base of a triangle, and the painter’s spotlight is more extensive. The closest that he comes here to a triangle is in the standing figures to the left of Nelson, whose role and actions appear incongruous. West’s painting succeeded not on its strengths, but on its timeliness and public adulation for its subject. Exhibited first in the artist’s studio, it apparently attracted thirty thousand visitors in just over a month. He went on to paint two further works on the theme, showing Nelson’s death below in the cockpit, and The Immortality of Nelson. 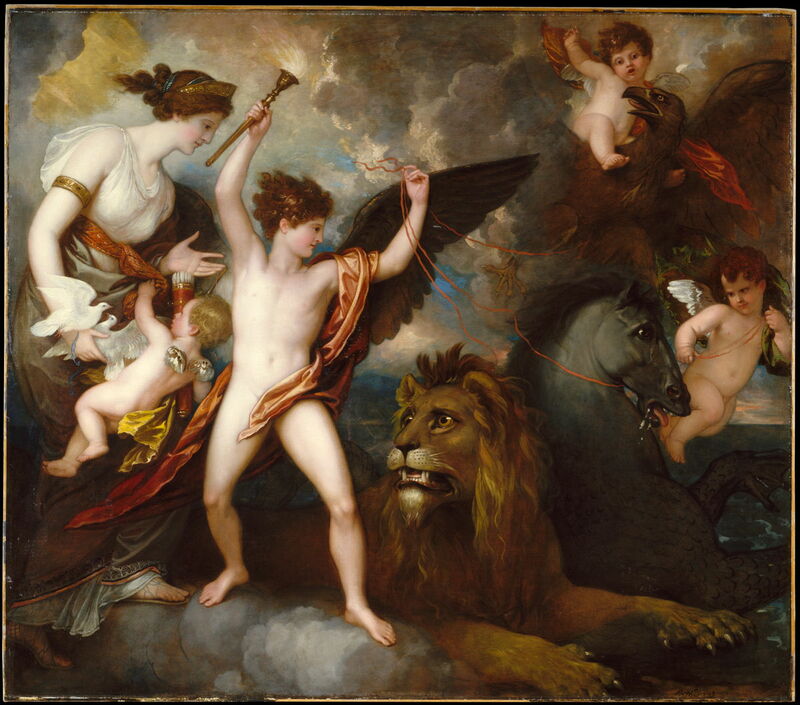 Benjamin West (1738–1820), Omnia Vincit Amor (The Power of Love in the Three Elements) (1809), oil on canvas, Metropolitan Museum of Art, New York, NY. Wikimedia Commons. West returned to classically-inspired allegory in Omnia Vincit Amor or The Power of Love in the Three Elements in 1809. Venus is at the left, as the goddess of Love, with her son, the winged cherub Cupid, complete with his bow and quiver of arrows. Standing near-naked with a burning torch in his left hand is Hymen, the young god of marriage, who holds three red leashes attached to symbols of three of the four elements of the classical world. An eagle stands for the element of air, a horse-like hippocampus for that of water, and a lion for earth. This painting remained in the artist’s studio, unsold, at the time of his death. 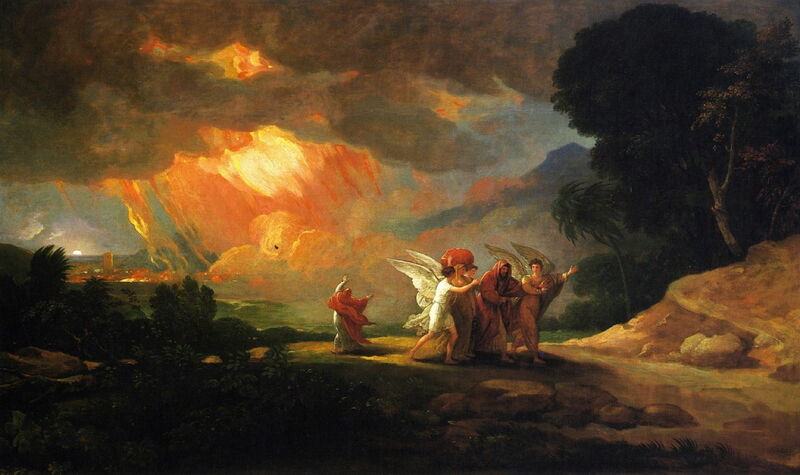 Benjamin West (1738–1820), Lot Fleeing from Sodom (1810), oil on panel, 119.7 x 198.44 cm, Detroit Institute of the Arts, Detroit, MI. The Athenaeum. With the increasing popularity of apocalyptic visions, and perhaps anticipating the art of John Martin, West’s Lot Fleeing from Sodom from 1810 shows this well-known scene from the Old Testament. Sodom (and Gomorrah) were rebellious and sinful cities. Lot and his family were probably the only pious people in Sodom. When God decided to destroy the cities, Abraham pleaded on behalf of their people, so God agreed to spare the cities if fifty righteous people could be found there. In spite of progressively reducing that number to ten, only Lot and his family could be found to be righteous. Two angels appeared to Lot, telling him to leave the city with his family, early in the morning. They were told not to look back, but to flee to the mountains. Lot negotiated to flee to the city of Zoar instead. Lot and his family left Sodom at dawn, and travelled safely to Zoar. However, his wife, who looked behind at the destruction of the cities as God rained ‘brimstone and fire’ on them, was turned into a pillar of salt. It is that moment which West chose for his painting: Lot’s wife stands alone, her arms raised at the truly awesome sight of the destruction of the cities, and is just about to be turned into a pillar of salt. Lot and his daughters are being ushered away hastily by two winged angels. Late in his career, West decided to paint a large portrait of his friend and fellow Philadelphian Benjamin Franklin (1706-1790), to give to the Pennsylvania Hospital, which Franklin had founded. Although he never completed that finished work, his smaller study, painted unusually on slate, of Benjamin Franklin Drawing Electricity from the Sky (c 1816), is now one of his best-known works. In 1752, Franklin may have conducted experiments in Philadelphia to demonstrate that lightning is electricity. The experiment shown, in which the scientist allegedly flew a kite in a thunderstorm and observed a spark pass from a metal key on the kiteline to his hand, is famous, foolhardy to the point of being suicidal, and almost certainly never occurred. 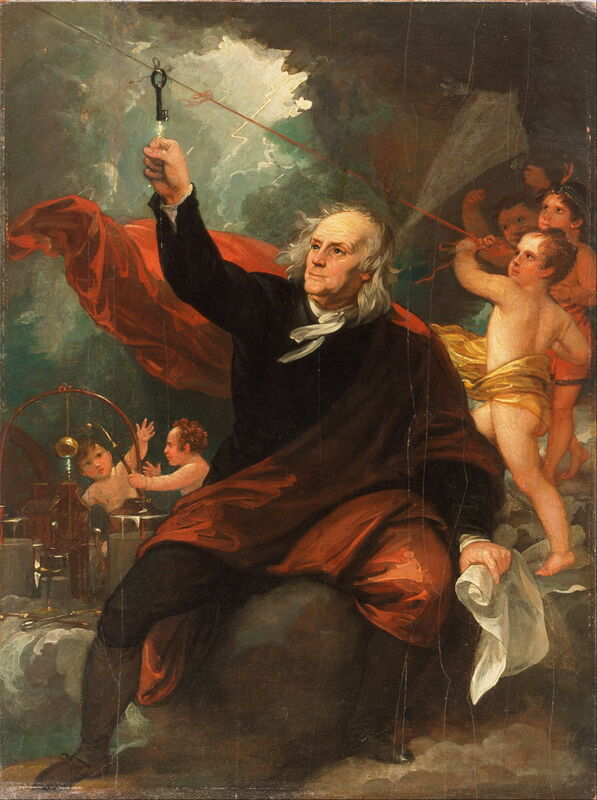 West turns this legend into a romantic allegorical fantasy, with Franklin sat on a platform of clouds, surrounded by naked putti-like children who are pulling on the kiteline and playing with a static electricity generator at the left. West also leaves us with the puzzling pale and ghostly image of a kite in the sky behind. It cannot be the kite on the end of the line, which is up to the left, nor can it be its shadow. Perhaps it was just a ghostly spirit representing West’s ‘modern history painting’. On internet sites, you will also see a painting titled A Domestic Affliction (also known as Annette de l’Arbre) credited to Benjamin West, with the puzzling date of 1831, by which time West had been dead for over a decade. That painting, in the Munson-Williams-Proctor Institute, Utica, New York, is not by Benjamin West at all, but by William E West. Yet this error is repeated on site after site, and the date given without question. Benjamin West died in 1820, when still serving as the President of the Royal Academy. He was given the state honour of burial in Saint Paul’s Cathedral, in London. Posted in General, Language, Life, Painting and tagged David, Franklin, history, Martin, myth, narrative, Nelson, painting, Poussin, West. Bookmark the permalink.